The Acumen Fund East Africa office recently hosted a breakfast meeting for all its investees. The motive of the breakfast was to provide Acumen’s investee organizations a platform to exchange ideas and explore avenues for collaboration. As an Acumen fellow I got a front row seat to see these brilliant entrepreneurs discuss issues and come up with solutions. The highlight for me was Ingrid Munro’s (Founder and Managing Trustee of Jamii Bora) response to the HR issues raised by some of the other investees, mainly around finding people (at all levels of an organization) willing to work for a social enterprise? Ingrid suggested a tough but tested solution. She asked all the investees to search for future employees right at the BOP, amongst the poorest of the poor, a demographic that is often overlooked due to job descriptions that come with required skill sets and expected educational qualifications. She gave examples of how some of the poorest of her customers joined Jamii Bora on small jobs and then went on to lead some of the major departments (IT, finance etc) within the organization. Her examples clearly illustrated her contention that employees from the BOP are not only capable of doing small jobs but with the appropriate training & mentoring, they can also grow to take up senior management positions. Ingrid’s strong belief in the innate ability of people living at the BOP is based on a simple truth – “The poor have to learn to survive and hence they just cannot afford to be dumb.” Ingrid opined that this survivor mentality combined with the hunger for opportunity to improve their lives makes people at the BOP bright prospective employees. It took an all-night train ride to get here from Hyderabad, but that’s nothing. Now that I’m riding on the back of a two-wheeler on a sunny Tuesday morning in rural Andhra Pradesh, it was well worth the trip. Today, I’m shadowing Surya Prakash, one of the District Coordinators at Scojo. 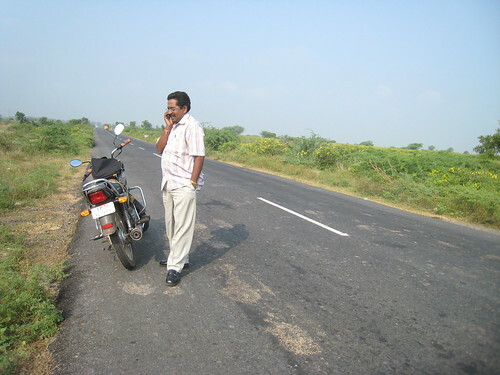 Surya pulls his motorcycle over to the side of the road to take a call. I take the opportunity to stretch my hips and legs. I am not a yogi yet! It’s a 70 km ride out to Rajam pali, the village where Surya’s team is hosting an eye camp today. His phone rings off the hook. For good reason: Surya manages 35 Vision Entrepreneurs. He checks in with them several times a week to help them plan upcoming camps and to track their sales progress. We get to the village. I see a new Vision Entrepreneur putting up the banners at the edge of the park where the camp is being held. They’ve gotten permission to use the office of the Sarpanch (a local government representative) for the day. Prospective customers have already lined up, giving their information at the front door and waiting on the porch to have their eyes screened. Kids from the school across the park have snuck over to peek in the windows, resisting elders who shoo them away. Be kind to them, I think, these are future Scojo customers! The Vision Entrepreneurs have a lot of flexibility – they can determine their own schedule. Some of them use it as supplemental income; some make it their full time jobs. Regardless, they all depend on Surya. They need new inventory and marketing materials for their camps but most importantly, guidance on how to sell. “Get me your reports and then we can talk about it!” He says to one of his team members with a smile. Selling reading glasses in villages far from your home can be lonely work. Which is why Surya has instituted team practices: Vision Entrepreneurs frequently go to support each other’s camps without a share of the earnings, knowing they’ll get the same support reciprocated. After the mid-day heat cooled off, we headed back to town. Surya dropped me off before going to his office to do paperwork. “What would you do if you had more time?” I asked. Surya would rather spend it with his team. It’s easy to imagine rural distribution models from afar, but they only comes to life through people like Surya who make “work” a verb.